“In that [Messianic] era … all pleasures will be abundant like the sand of the earth” (Laws of Kings 12:5). Now if all the luxuries of the world will be abundant, as Rambam says, they will lose their value and will be equated with sand! The person will not experience delight from those pleasures. A question then arises: How will the human sense of pleasure operate at that time? Certainly if G-d created it, it must have some function. But the answer is, as Rambam continues to explain: “… the one preoccupation of the whole world will be to know the L-rd” (Ibid). In other words, the pleasure of that era will be in knowing G-d. As David Hamelech [the king] said: “To behold the pleasantness of the L-rd” (Tehillim [Psalms] 27:4), and as the verse says: “Then shall you delight yourself in the L-rd …” (Yeshayah 58:14). When we speak of the legacy of the great sages of old, in addition to the knowledge we garner from their written works there is also much to be gleaned from studying their biographies and their talks, customs and lifestyles. As the Talmud tells us: “From the casual conversation of R. Gamliel we have learned …” and “… even the casual conversation of scholars demands study.” How much more so, can we learn from their actions and regular activities. From the life story of Rambam we may learn much in the way of actual Halachah, “guidance,” for the perplexed, and we may also observe the real, down to earth, application of his teachings. This we find in the Code [Mishneh Torah]. In the Rambam’s daily lifestyle, which serves as a living example for us, how we are to help those who need our help, he shows us that it must be done without consideration for the difficulty of the service, to the point of self-sacrifice. For the Rambam set aside many hours every day for helping others, without being concerned for his own well-being. Therefore, in addition to learning in the Code of Maimonides how one must act to improve the world and civilization we also learn a lesson from the Rambam’s personal daily activity, that he toiled and dedicated his life to helping everyone, Jews and Gentiles, dealing with the most basic of all assistance, their health. And this brings us to the importance of organizing programs in honor of Rambam even among Gentiles. As we see that Morocco, Spain, Egypt and the U.N. have designated times and activities to honor Rambam, recognizing him as the Great Codifier and Prince of the Jews — being that he was appointed as Nassi [leader] over the Jewish community in Egypt, etc. Thus it is important to encourage Gentiles to honor the 850th birthday of Rambam. It should be stressed that Rambam cared for everyone, Jew and Gentile alike, so that in his Code [the Mishneh Torah] he presented the Laws for them (Seven Noahide Laws), and in his daily life he extended a caring and helping hand for all. 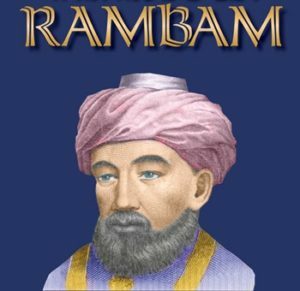 This will increase the knowledge of Rambam in the world and will bring an improvement in the civilization of the world. All efforts should be expended to organize meetings and celebrations among the nations of the world to honor Rambam. Similarly, the issuing of postage stamps with Rambam’s name or likeness is likewise a form of honor for Rambam and will spread the teachings of Rambam and the improvement of civilization in the world.